All I want to do is tell you everything about this play, but I won’t. I’m actually barely going to review it. I don’t want to spoil anything about this new show. 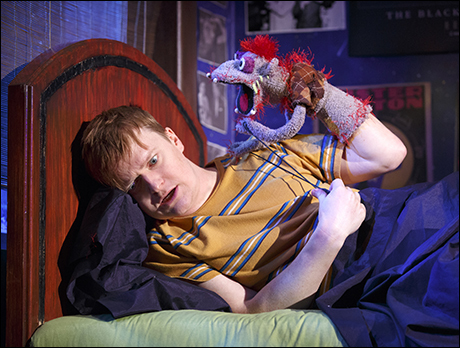 Well, not so new; Hand to God has had a long journey to Broadway. First it ran at Ensemble Studio Theatre (EST) in 2011 and then last year Off-Broadway at MCC Theater. I remember hearing about it both times but never made the effort to see it. Now it’s made the leap to Broadway, and I encourage you to make ALL of the efforts. I’ll tell you a few things to whet your appetite. Hand to God takes place in the small town of Cypress, Texas. A teacher there is trying to help the kids connect to Jesus and religion through puppetry. Then we meet the soft-spoken Jason, one of the students, whose hand puppet Tyrone may or may not be possessed by the Devil. Yup. It’s a first-rate cast: Geneva Carr, Marc Kudisch, Michael Oberholtzer, Sarah Stiles, and the mind-boggling Steven Boyer as Jason (and Tyrone). I hope he wins all the Tonys. The set is spot-on; the script fresh and laugh-out-loud hilarious. It’s a cross (ha) between The Book of Mormon and Avenue Q, but it’s not a musical. A word to the easily offended: like in Mormon, there is some outrageous humor. It can be crude, sexual, and full of cursing. But man oh man, is it funny. You won’t believe some of the stuff you’re seeing and hearing. You may just blush in your seat. This new Broadway play will make you laugh. It’ll make you think. It might make you squirm a little bit. It’ll definitely make you appreciate good theatre. Just trust me – you’ll enjoy it. Hand to God.